As Global Entrepreneurship Week kicks off, Las Vegas-based Tech Cocktail and the Seed Accelerator Ranking Project released a ranking of the top 10 cities with the most growth in startup funding since the arrival of an accelerator. 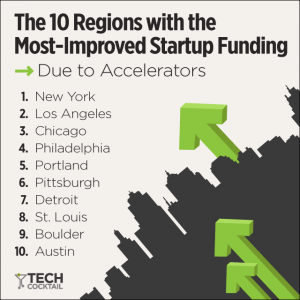 This study looks at the impact of accelerators on startup scenes. The list is topped by New York City, followed by Los Angeles and Chicago. Silicon Valley and Boston were excluded from the ranking because their ecosystems were already very developed when the first accelerator arrived. “Since their focus is on accelerators, they set out to answer this question: which accelerators have had the biggest impact on their ecosystems? One of the first ways to measure this is by looking at how funding activity has changed,” wrote Kira M. Newman in this Tech Cocktail piece. In addition to the ranking, Tech Cocktail is releasing a report taking a deeper look at four cities on the list: Austin, Detroit, Pittsburgh, and St. Louis. While the ranking focuses on funding, the report looks at other ways these startup scene have grown since the first accelerator arrived – a history of the ecosystem through the eyes of locals. Get the report here. About the Seed Accelerator Ranking Project: The Seed Accelerator Ranking Project has ranked the top US accelerators in 2011, 2012, and 2014. It’s now run by Professor Yael Hochberg of MIT, Professor Susan Cohen of the University of Richmond, and Daniel Fehder of MIT. About Tech Cocktail: Tech Cocktail (tech.co) is a media company and events organization for startups, entrepreneurs, and technology enthusiasts. Since 2006, its goal has been to amplify local tech communities and give entrepreneurs a place to get informed, get connected, and get inspired. Tech Cocktail dedicates itself to covering news, how-to’s, up-and-coming startups, and industry trends online, and hosting events in over 20 cities in the US and abroad. From a simple community-building event, Tech Cocktail has transformed into a full-fledged media company with millions of fans, followers, and supporters across the globe. Tech Cocktail has hosted local mixers, breakfasts, conferences, festivals, and other events around the country that have attracted thousands of attendees, educating entrepreneurs as they showcase their latest achievements and the local technology communities they live in.